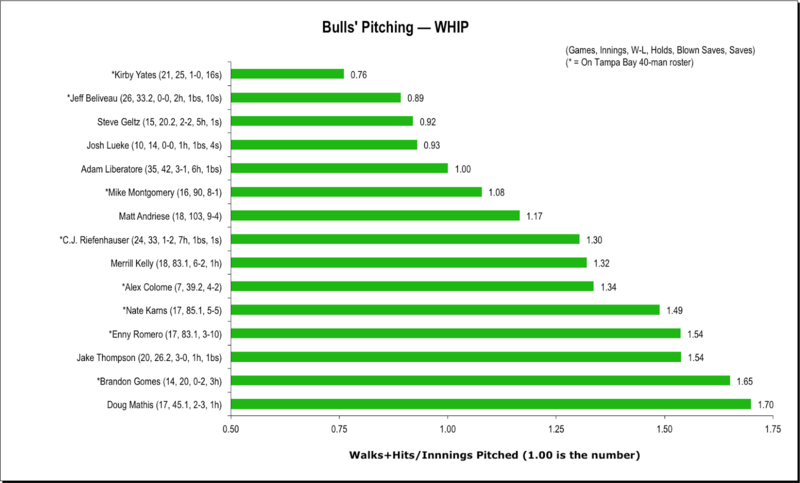 The Bulls have had lot of pitchers so far this year, including a couple who are with Tampa Bay at the moment. The charts include ones with them now, or ones who might be coming back. Erik Bedard only pitched one game before being called up. Kirby Yates put in 21appearances and I’m leaving him on the charts because he could be back. Brad Boxberger is on his third visit to Tampa Bay and looks like he’s going to stick. Juan Carlos Oviedo’s seven 1-inning appearances with the Bulls were officially rehab status. Jeff Beliveau has made three trips to join Tampa Bay (he’s pitched 2 innings for them). Juan Sandoval was released back near the end of May. C.J. Riefenhauser has made one trip to Tampa Bay and was on the disabled list for a couple of weeks in May. Jim Patterson came up from Montgomery, made 5 reasonably successful appearances, and went back. Braulio Lara came up from Montgomery, made 9 not very successful appearances, and went back. Brandon Gomes was optioned down from the Rays near the end of May. Josh Lueke came down in mid-June. Add another rehab and a couple of position players thrown to the wolves and all together, 24 different ball players have been on the mound of the Durham Bulls this year. In 2013, 26 different guys pitched. The Bulls are on their way a new record? By the way, the Rays have had 20 different pitchers this year. I’m not a big fan of the Fielding Independent Pitching stat for minor leaguers for a couple of reasons, one of them being that I’m not sure I trust the constant value (in this case 3.2). 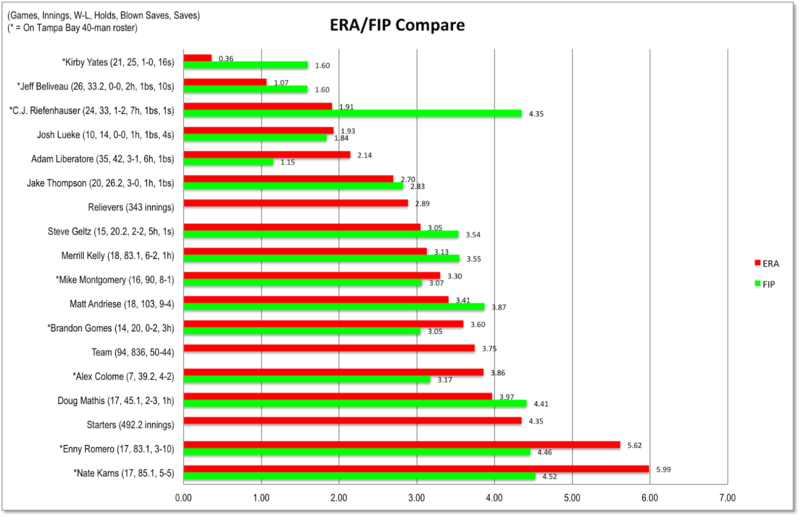 Still, if FIP is an estimate of future performance then Adam Liberatore and Brandon Gomes are looking good. A couple of others, not so much. What jumps out is that two of the starters, Enny Romero and Nate Karns, simply aren’t doing very well no matter how you measure their performance. And the starters as a whole are a full 1.5 runs worse than the relievers as a group. Walks/Hits per Inning Pitched is an interesting pitching stat and sometimes brings a different perspective. In this case, the bottom three (Mathis, Gomes, and Thompson) seemed to be doing better in terms of overall results. Not surprised to see Romero and Karns near the bottom though. 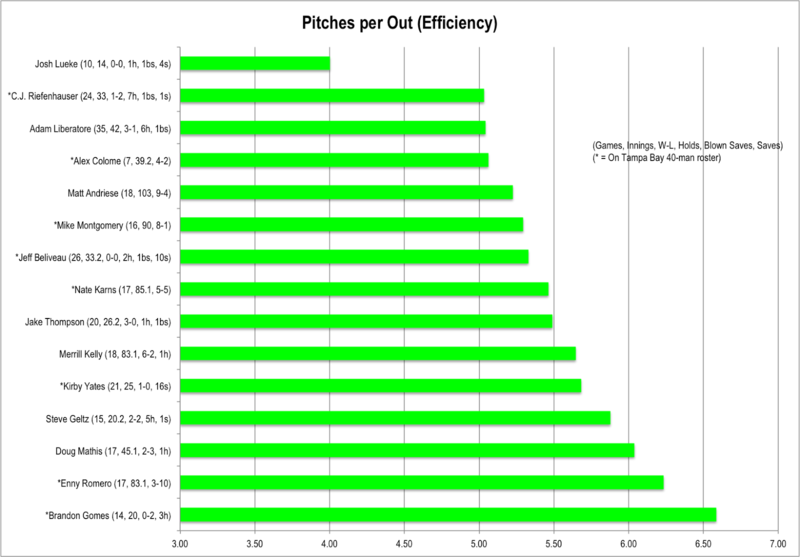 Lastly, in the just for fun category, is a chart of pitches made per out. Our home-brewed measure of efficiency. Sample size (Gomes and Geltz) may matter quite a bit here, but certainly Romero and Mathis are working awfully hard to get through their innings. Bats Come Alive, Joe Bateman in the House?